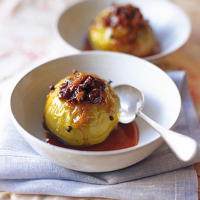 Baked apples are great at this time of the year when there's not much else around in the way of fruit. We tend to serve this with a caramel mousse in the restaurant but at home, vanilla ice cream or crème fraîche is fine. The sauce should be served at room temperature, not piping hot, so everything can be prepared well in advance. Preheat the oven to 180°C, gas mark 4. Mix together all the ingredients in a bowl except for the apples and the cloves. Fill the cavity with the filling, and stud each apple with 5 cloves. Place in an overproof dish and put in the oven for 20–25 minutes until they become soft and slightly caramelised. Just before you are ready to eat, make the sauce. Put the sugar in a pan with 1 tbsp water, heat to dissolve, then boil until you have a dark caramel. Whisk in the cream, then the butter. Serve the apples with a scoop of ice cream or crème fraîche and pour over the sauce.